Parties require many essential materials: glassware, serving plates, chairs, tables, linens, napkins, and cutlery, to name just a few. Whatever the need, we can take care of all the necessary rentals. That can include complete set-up and take-down of your event, so you won’t have to raise a finger. If your event location is not suited for cooking, Savoury Chef Foods can set up an on-site kitchen with all the appropriate appliances and cooking equipment, including tents, ovens, mobile hand washing, refrigeration, and more. Our rental reservation fee is twenty percent of the total cost of rentals – this includes our rental insurance. We include rental insurance in all of our event proposals to protect the client from any additional breakage or rental costs after an event is complete. We charge a rental consultation fee if you choose to consult with us on any specialty rentals. Setup and Take-Down fees are billed out as staffing times for each event. Please consult with us about your setup needs, and we can accurately quote it in your event proposal. Learn – Tables and Chairs! 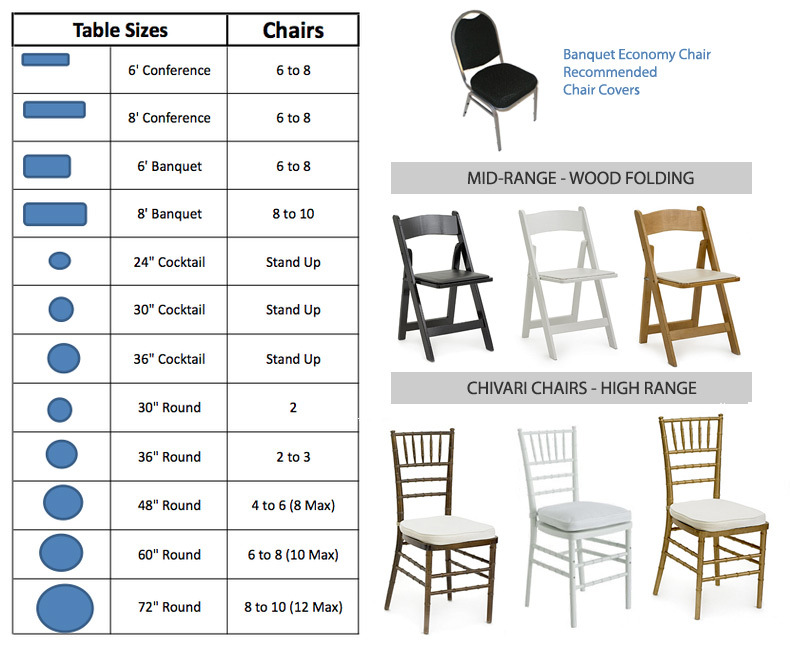 This is a quick resource on our recommendations for tables and chairs — how many people fit comfortably per table, and what style of chairs are available to rent. We list the most common types available as a good reference and starting point, but there are others available from furniture rental companies that we are happy to supply for you as well. 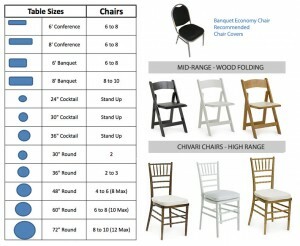 These are the most common sizes of tables, with information on how many people each will fit comfortably. We recommend having clearance of 3ft or more behind each chair.